This 23-ft circle in full sun provides food for the larval stage and the mature insects of all our native pollinator groups—butterflies, bees, wasps, beetles, and flies. Adults often eat nectar and pollen from any flower, but caterpillars (larvae) are often picky about what plant is good to eat. Here are butterfly weed (feeding the Monarch butterfly larvae), common violet (for Great Spangled Fritillary), and a grass that hosts many species, among others. These essential insects keep our food chain and our New England landscape healthy. We need pollinators. Fewer native plants mean fewer pollinators (and other insects) that are so essential to our food chain and the web of regional ecosystems. These insects both ensure food production and are, in turn, food for birds. Caterpillars need food too. A pollinator garden provides food for both the larval stage and the mature insect. Butterflies are often omnivores for nectar and pollen, but caterpillars (larvae) are more particular. The Monarch butterfly lays its eggs on milkweed (Asclepias sp.) because it has evolved to incorporate a chemical in that plant to make itself and its larva taste bitter to any predator. The common violet (Viola sp.) is the preferred food for the Great Spangled Fritillary caterpillar, although the adult butterfly enjoys various flower nectars. Garden plants are bred for beauty, not food. Hybrid forms may not provide the necessary food for larvae or nectar and pollen for bees and butterflies. Most nursery garden plants are hybrids—plants cross-bred to strengthen traits such as length of flowering, color, hardiness, and new forms. However, such breeding may unintentionally weaken or change the characteristics that attract certain insects. Additionally, if a hybrid plant has less nectar, mature pollinators may still visit it but get less food for their effort. Research is ongoing on this issue. Not just honeybees. Pollinators come in all shapes and sizes. Honeybees were introduced from Europe both for their honey and to pollinate crops. Yet there are 4,000 native bee species in North America, some as tiny as a small fly. Beetles, wasps, and flies also pollinate plants along with moths and butterflies. Pollinators at risk. Pesticides are usually fairly nonspecific. That is, they may kill aphids, whiteflies, and other troublesome insects, but also kill the pollinators that feed on the same plant or flower. Systemic pesticides that are present throughout the plant tissues and flowers are particularly dangerous to any flying insect. We know now that DDT is particularly harmful to the birds that eat insects. We are learning that other pesticides, such as the neonicotinoid insecticides, may have equally devastating effects for many insect species including bees (these pesticides have been banned in Europe). (Avoid products with chemical names such as Imacloprid, Clothiandin, and Dinotefuran. ). Sources: Xerces Society, Attracting Native Pollinators: Protecting North America’s Bees and Butterflies. Check butterfliesandmoths.org, and other websites. Grow Native Massachusetts www.grownativema.org Also the websites of the cooperative extension services for many states. 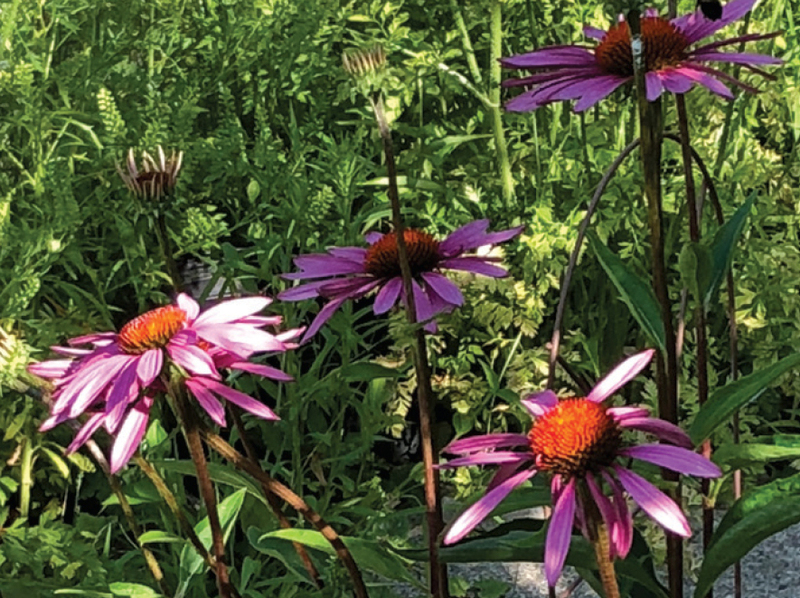 Founded in 1994 by residents eager to share and expand their horticultural knowledge, the Somerville Garden Club is a thriving group of gardeners from Somerville and beyond. Enthusiasm captures the spirit of this nonprofit organization dedicated to sharing gardening interests and expertise, sustaining the environment, and promoting urban green spaces. Both novice and experienced gardeners benefit from monthly meetings featuring presentations by experts and may volunteer at community sites and events. The Somerville Garden Club welcomes anyone with an interest in gardens and gardening. Sign-up to join the Somerville Garden Club!